Mapping China: Which provinces are most dominated by state-owned firms? The answer I’ve come up with is not quite the one I expected, but it does make sense I think. Beijing is number one, naturally–it’s the place where all the major national state-owned enterprises are headquartered, and SOE influence is inescapable. But after that easy one, anecdotal impressions do not provide much of a guide. According to my scoring system, the provinces where SOEs have the biggest economic weight are the wealthy coastal municipalities, and the far western provinces. 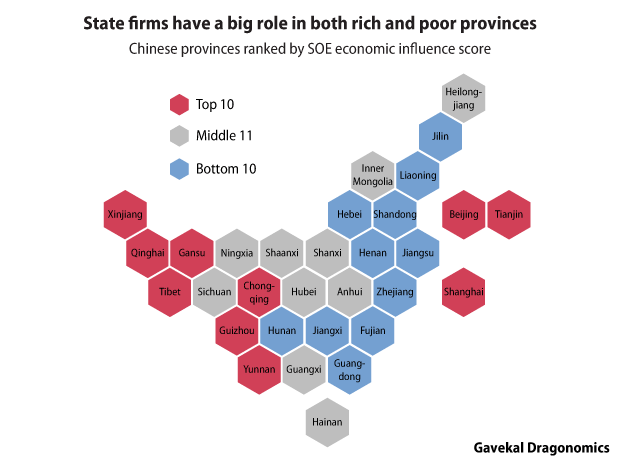 In other words, SOEs dominate both the richest and poorest provinces in China, and play a relatively lesser role (though still a large one) everywhere else. It is interesting that this pattern does not map that well onto the geographic distribution of China’s economic slowdown. Liberals like Sheng Hong of the Unirule Institute argue that the slowdown is caused by the poor performance of SOEs. At least in terms of simple correlations, that does not look to be totally true–indeed the provinces with a high SOE influence score are among those where economic growth has held up relatively better. This is probably because spending by SOEs is one of the main channels the government uses to support growth (it’s the Chinese replacement for countercyclical fiscal policy, which otherwise they don’t do much of). The provinces where growth has been really terrible are those whose industrial structure is most exposed to the downturn in housing construction, which mainly means places with big mining or steel sectors. Since a lot of mines and steel mills are in fact privately owned, these provinces are actually not as SOE-dominated as some others. I think the poor western provinces have such high SOE influence scores because they do not have much indigenous industry, and are heavily dependent on investment projects funded by the central government and SOEs. I would not let SOEs are completely off the hook, though it is tricky to disentangle the effects of state ownership and the effects of industrial structure. You could argue (and I probably would) that SOEs tend to make poor investment decisions and thus contributed to excess capacity in the steel and mining sectors, making the slowdown worse. But this argument is complicated by the fact that the provinces with the most resilient, service-driven economies–Beijing and Shanghai–are also incredibly state-dominated. So there’s not a straight correlation between more SOE influence and worse economic outcomes. At first glance, the relative outperformance of services against heavy industry seems to be a bigger effect than the outperformance of private firms against SOEs. Anyway, food for thought, and further work. And now to the fun part–the map! I use my hex grid map of China in order to show the province names more clearly, and not diminish the importance of the three coastal municipalities which are geographically small but economically large. The three indicators I used to compute the SOE economic influence score are: state-owned enterprises’ share of gross industrial output value (as of 2011), state-owned enterprises share of fixed-asset investment (as of 2012) and the ratio of local state-owned enterprises’ assets to provincial GDP (as of 2013). For each indicator I use the most recent data available, but these ratios do not change dramatically over time. I normalized the reading of each indicator and then summed the normalized scores for each province to generate the overall score and ranking. ← Previous Post Du Runsheng, world’s most influential economist? Very interesting post! It corresponds quite well to what Yasheng Huang wrote about Shanghai in his book “Capitalism with Chinese Characteristics”. I have a question about how you went about defining “SOE”. Specifically, how did you handle companies that are classified in the official statistical tables as, e.g., “shareholding firms” or “shareholding cooperatives” rather than as “state-owned” (guoyou)? Did you treat those companies simply as “not state-owned”? I ask, because I’m slightly puzzled by your results for Shanxi, in particular. Good question – definitional issues are always a problem with SOEs. For the SOE share of fixed-asset invest and gross industrial output, the statistical category is “state-owned and state holding” or “state-controlled enterprises” which includes companies that have a shareholding structure but in which the state is the largest shareholder. I therefore think this category is relatively reliable, and does not understate the SOE role as the can happen with pure “state-owned” category or other measures that use registration status rather than ownership. The Ministry of Finance data on SOEs, the third component of my index, also clearly covers SOEs that have been restructured into shareholding companies (the vast majority), though it is not clear how the exact definition they use might differ from the one adopted by the NBS. Shanxi in fact gets very high scores on all three of my indicators, it’s just that there are provinces that are even more extreme cases. The extreme cases tend to be provinces that just don’t have much going on and are dependent on government subsidy projects. Shanxi actually has an economy, even if it is heavily resource dependent and dominated by SOEs, so it is relatively a bit less SOE-dominated than the poorest places out west. If you took out some of the special cases, like Tibet, then Shanxi would indeed rank very high. Hi Andrew. This China mapping work you are doing is absolutely brilliant. Just from a visual inspection, I would be a little bit kinder; the SOE rank does seem to map relatively well on your earlier Manchurian led slowdown mapping work, particularly for Eastern and Western most provinces. This would suggest that SOEs are playing an important enabling role in transitioning the economy via the rotation to tertiary/services in the higher income provinces and catch-up in the lower income provinces – most probably by being a government spending conduit. Great stuff! Thanks for posting this, it’s interesting stuff. I was wondering if you have ever come across similar data below the provincial level. I’m a Ph.D. Candidate in political economy and a colleague and I are trying to find lower level data because there is a significant amount of variation within provinces we’re interested in. Good question. A lot of Chinese data is available at the prefecture and county level, but it tends to be mainly aggregate figures. The more disaggregated indicators I used here I could only find at the provincial level, and even that required going deep into some obscure yearbooks. There might be other sources that could give you more detailed local data, but I haven’t found them.